Janelle In Real Life: neutrals for (almost) summer! The sun is out and life is so good, you guys. I love being able to go out for walks, play at the playground, and go to the pool! We've been having lots of rain up until the last few days so I've been dyyyying for this weather. Also is it super lame of me to be discussing the weather right now? Kinda feels that way. I'm such a fan of neutrals like in this outfit, it's pretty much my uniform. Strappy sandals and flowy tops for the win this summer! I was lamenting to my husband about how it sometimes feels like I can't wear my cute clothes anymore because they'll just get spit up all over them (my 4 month old has craaaazy reflux). But he pointed out to me that this particular shirt was actually spit up colored (aka white) and so I shouldn't even worry about it. Such a good optimist, that man. Great look! Neutrals are my favorite too, they always look so chic! 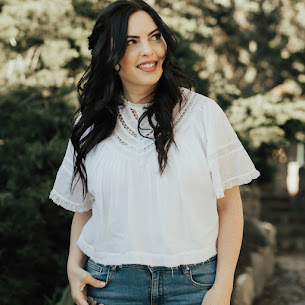 I'm stopping by from the Trend Spin Linkup!